TOKYO (AP) -- Philip Morris, maker of Marlboro and other major cigarette brands, is maneuvering to keep itself in business in a post-smoking world with an advertising blitz in puff-happy Japan and other tobacco-loving markets. One of the biggest purveyors of tobacco products, it says making the world "smoke free" is its goal. The company is renewing its effort to win over new generations of tobacco users to its iQOS devices, which heat tobacco without burning it. It's found a warm welcome in Japan, home to 5 million of the nearly 6 million users of the product. 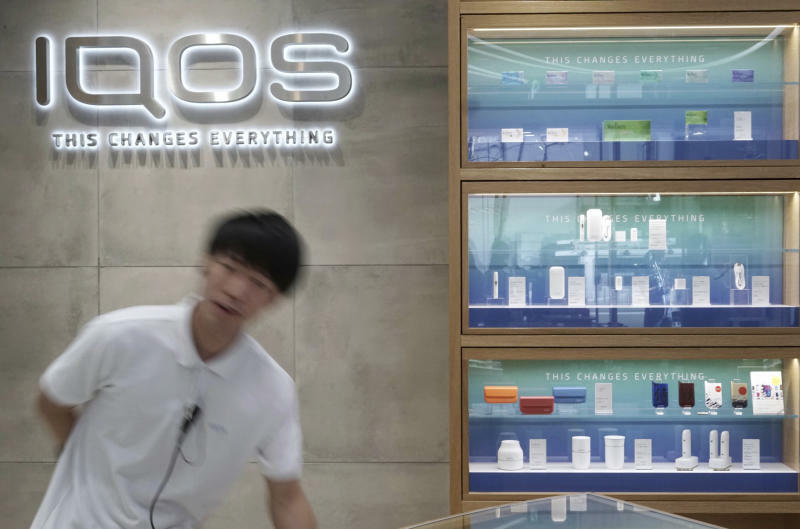 "Japan is a country where people like innovation, like to experiment and try new products," Chief Executive Andre Calantzopoulos told The Associated Press during a trip to Tokyo this week to promote new iQOS products. By heating tobacco without burning it, iQOS gives users vapor and flavor without the hazards of smoke and tar from cigarettes, cigars and pipes, the company says. It's different from e-cigarettes, another popular "reduced risk" product, which don't contain tobacco but instead vaporize a liquid usually containing nicotine. The iQOS has yet to win U.S. Food and Drug Administration approval, but it's sold in much of Europe, in Turkey, South Korea, New Zealand and Colombia. The company's rebranding effort seems to be paying off in Japan, where the company has opened nine iQOS stores offering free WiFi and drinks in trendy districts nationwide. Mami Kugishima, a 32-year-old hair stylist and iQOS user standing in a designated smoking area near a train station, said she likes the way the smell doesn't get in her hair. "It calms me down," she said, sucking on her crystal-decorated iQOS, while acknowledging it would be best to quit. "I like it when I go out for drinks." The World Health Organization points to tobacco as a leading cause of death, killing up to half its users, or more than 7 million people every year. Of those, about 890,000 deaths are non-smokers exposed to secondhand smoke. Philip Morris says research it has funded shows health risks are reduced with iQOS, while they are not zero. The device's lower temperatures release less cancer-causing substances than when tobacco is burned in regular smoking, while still providing nicotine to the user. Calantzopoulos says wider use of the device would help people's health. Critics accuse the company of glossing over the hazards in its effort to lure new generations of tobacco users, an allegation it denies. Bungaku Watanabe, a former smoker who has led a campaign against smoking for 40 years, believes Japan is going too easy on tobacco, including iQOS. The government has a big stake in the tobacco business, owning a third of stocks in major cigarette company Japan Tobacco Inc. as its top investor. The industry was a government monopoly until 1985, and is a huge source of tax revenues. Cigarette packs don't carry graphic pictures and warning labels about the "risks of a stroke" or "addiction to nicotine" are in fine print. "This is really an unusual situation for a developed country," said Watanabe, 81. Philip Morris is still one of the biggest makers of conventional tobacco products. Apart from Marlboro, its brands include Parliament, L&M and Chesterfield. It sells the local "heritage" brands Dji Sam Soe, Sampoerna A and Sampoerna U in Indonesia; Fortune and Jackpot in the Philippines; Belmont and Canadian Classics in Canada; and Delicados in Mexico. A basic iQOS kit, which includes a charger, starts at 7,980 yen ($71) in Japan. Fancier versions cost more. Refills, made of tobacco leaves that are ground, made into sheets and then crimped, look like tiny cigarettes. They go for 500 yen ($4.40) a pack — about the same as a pack of Marlboros at 510 yen ($4.50). In Japan, as elsewhere, smoking is gradually tapering off. Forty years ago, 75 percent of adult men were lighting up and non-smoking spaces were a rarity. Now most office buildings confine smoking to designated rooms or spaces outside. About 28 percent of Japanese men smoke these days, and 18 percent of adults overall. That's lower than Indonesia or Russia, but higher than Brazil or Mexico. In the U.S., the rate is 14 percent. Shunichi Ihara, a medical doctor at a Tokyo clinic that helps people stop smoking, says some of his patients are trying to wean themselves off iQOS. "It's best if people all stop smoking," he said.